The number of new cases of pulmonary plague has begun to decline in all active areas across the country. In the past 2 weeks, 12 previously affected districts reported no new confirmed or probable cases of pulmonary plague. From 1 Aug 2017 to 24 Oct 2017, a total of 1309 suspected cases of plague, including 93 deaths (7 percent), were reported. The figures in this report are based on a rigorous data cleaning, verification and analysis process aimed to give a better understanding of the dynamics of the epidemic. Of these, 882 (67 percent) were clinically classified as pulmonary plague, 221 (17 percent) were bubonic plague, 1 was septicemic, and 186 were unspecified (further classification of cases is in the process). Since the beginning of the outbreak, 71 healthcare workers (with no deaths) have been affected. Of the 882 clinical cases of pneumonic plague, 235 (27 percent) were confirmed, 300 (34 percent) were probable and 347 (39 percent) remain suspected (additional laboratory results are in process). 14 strains of Yersinia pestis have been isolated and were sensitive to antimicrobials recommended by the National Program for the Control of Plague. Between 1 Aug 2017 and 24 Oct 2017, 29 districts have reported confirmed and probable cases of pulmonary plague. The number of districts that reported confirmed and probable cases of pulmonary plague during the last 2 weeks reduced to 17. About 70 percent (3467) of 4990 contacts identified have completed their 7-day follow-up and a course of prophylactic antibiotics. A total of 7 contacts developed symptoms and became suspected cases. On 24 Oct 2017, 1165 out of 1239 (94 percent) contacts were followed up and provided with prophylactic antimicrobials. 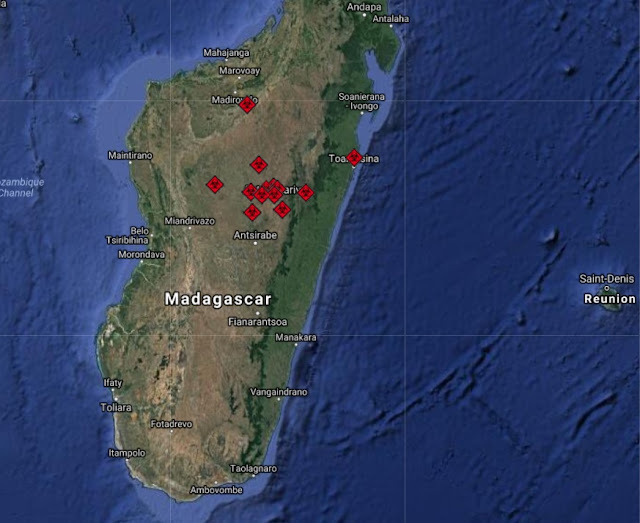 Plague is endemic on the Plateaux of Madagascar, including Ankazobe district, where the current outbreak originated. A seasonal upsurge, predominantly of the bubonic form, usually occurs yearly between September and April. In 2017, the plague season began earlier and the current outbreak is predominantly pneumonic and is affecting both endemic and non-endemic areas, including major urban centres such as Antananarivo (the capital city) and Toamasina (the port city).